Thank god it's not covered in hideous armor like the PvP ones. This will be for sure one of my favorite mount even i got over 350 atm. It looks so beautiful without all this armor , a true dreamrunner unicorn . NOOOO.....!... U give us flying... U give us a gorgeous mount.... But it can't fly? Saw the entire video to see if there's a flying animation. Couldn't find one. Hope this isn't true. The mount of my dreams. I don't care if it doesn't ~fly~. Not everything needs to fly. Wild Dreamrunneris a low-drop from the 7.2 post-exalted (paragon) emissary chests, specifically from the Dreamweaver Cache. Fine looking herbivore. Didn't get the drop, but the gold was worth it. Got this today from a Dreamweaver Cache. Beautiful Mount that does a spin when jump is pressed at stand still. I have opened 13 Rep caches...No damn mounts...only gold, curious coins, resources...I am not doing this for that crap. Starting to get discouraged when I see people "supposedly" getting the mount the first time. Do we know the drop rate yet? If it's 1%, then farming this will be difficult. My back-of-envelope calculation says that one character running just the weekly emissary will get a chest every 4.8 weeks. If someone with average luck requires 50 chests to get the mount, that will take 4.5 years. If you do every Dreamweaver world quest, every day (assuming an average of 8 are offered per day), you can get a chest every week. But then with average luck you'd need a year to farm it. Two years if your luck is bad. To get it in a reasonable amount of time, you'd need multiple characters doing this. I hope it's not 1%. After you get exalted with Dreamweaver reputation, you need to farm more 10k reputation through dreamweaver world quests/tokens in order to receive a: Dreamweaver Cache. In this cache there is a small chance to get the Wild Dreamrunner. 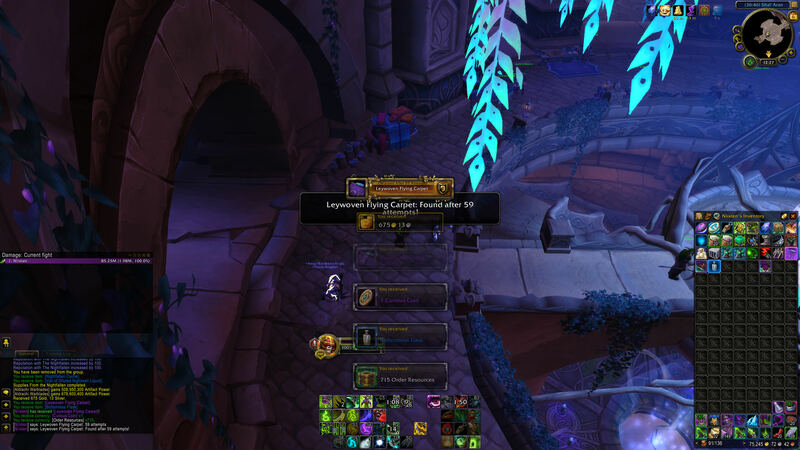 Just like dreamweaver , all other legion reputations have this "special farm sistem" and each 10k reputation farmed you get a box with a small chance to get a mount/toy/pet - depending the box you open, its one special reward. My guess about the drop rate of the special itens is about 5~10%. I will show my farms numbers and you can take your own conclusions (farming with 3-4 alts). Her name is a golden bell hung in my heart. I would break my body to pieces to call this mount once by her name. As for you and your heart and the things you said and didn't say, the Wild Dreamrunner will remember them all when men are fairy tales in books written by rabbits. Am prepared for the long haul, so i decided to bring 2 more alts to exalted. 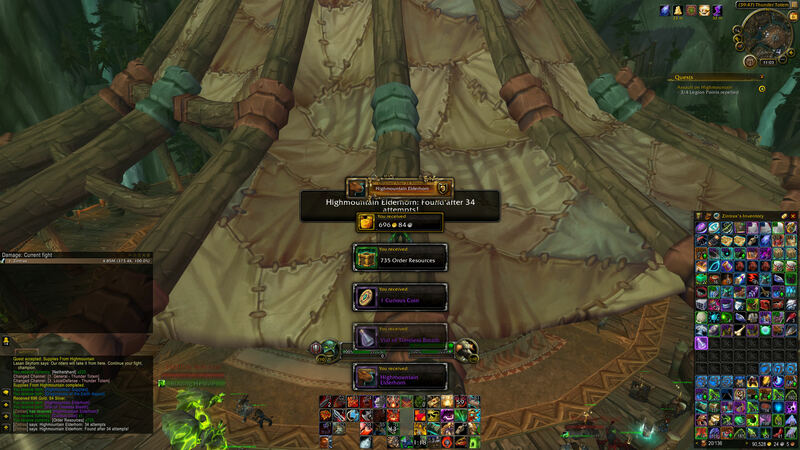 Was 95% to exalted when it dropped today after my 6th try. Thankfully, it wasn't 60 more boxes or 1/2 million in reputation as posted earlier by some users here. Glad it's done. Love the mount, but hate the "fanatic" galloping animation. Wish it could fly too. /Mountspecial is so cool. May good luck shine on those who are still farming this beautiful mount. 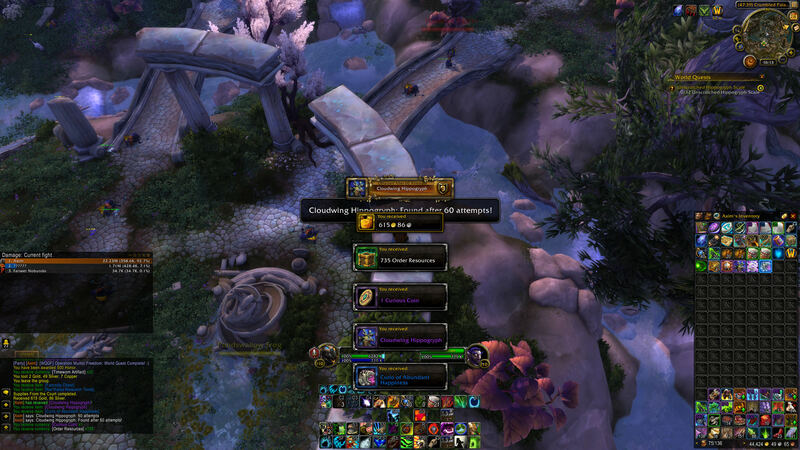 I just got this and Highmountain Elderhorn from Paragon caches today. It could be coincidence, but I hope it is instead because they greatly increased the chance of getting the mounts/pet/toy from the Paragon caches. For some reason it leaves behind purplish hoofprints pretty similar to the ones of the Accursed Wrathsteed. Hey....... Why is Xcryon here? Since 12/12/17, I have recorded all my paragon chest opening sessions. So far I've opened 77 dreamweavers caches and still no mount. I'd estimate that I've opened around 110-130 in total after 7.2.. So I guess that this game is realistic since it seems that unicorns are not real. 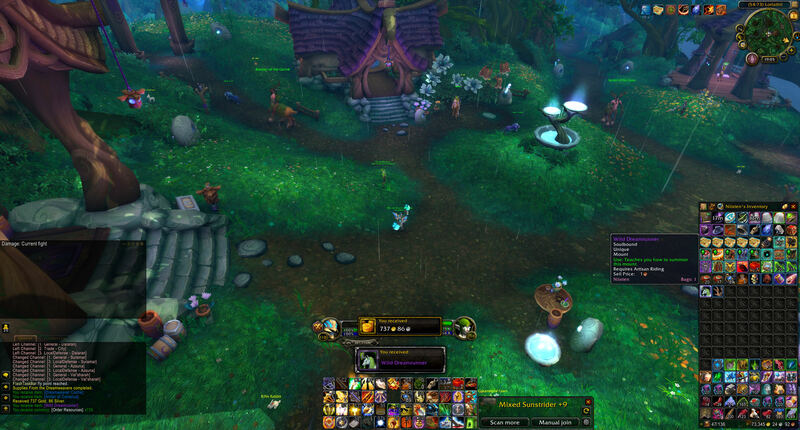 On a side note, I've gotten all other broken isles paragon mounts at least twice, without even farming those anymore. About methods, so I've just done class hall rep missions on 10 characters and kirin tor and DW emissaries, then sent all boa tokens to my human mage and waited for DMF for that extra 10% rep. I started with 1 character and ended up farming on 12 characters for all paragon rewards. Woot! Just dropped for me! So happy! Love it but...whyyyyyy? Why can't this unicorn fly! It probably took me ~70 caches for me to get this. I just found this in my cache. I don't really need a yellow horse but I'll take it. Got this in a cache yesterday, but disappointed to see that it runs like a hyperactive goat. Caveat emptor. In order for blizzard to improve our QOL we must help ourselves. Please make an in-game suggestion to streamline Legion quests, just like in MOP. If you are already exalted on 1 character in your battlenet account with a Legion faction, any subsequent gains on any character on your account should be made 100-200% more. Please visit this thread in EU forums, or make your own on top of suggesting in-game. "Dreamrunners flit between this world and the Emerald Dream at will, reveling in their wild nature."